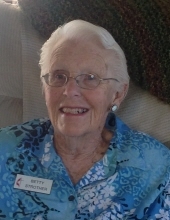 It is with great sorrow for the family of Betty Strother to announce her passing on January 26, 2019 at the age of 94 years. She leaves to mourn her passing, her children (John deceased) (daughter in law Elaine), Bob, Greg (Sue), Sara (Robin), Suzanne Campbell (Tony) and David (Marla). She was Grandma to nineteen grandchildren and thirty one great-grandchildren. Betty was predeceased by her husband Charles “Doc” in 2011 and son John in 2016. Celebration of Life will be held Saturday February 2, 2019 at the United Church in the Valley 125 Royal Ave Turner Valley at 2:00 p.m.
To send flowers or a remembrance gift to the family of Betty Gertrude Strother (Black Diamond), please visit our Tribute Store. "Email Address" would like to share the life celebration of Betty Gertrude Strother (Black Diamond). Click on the "link" to go to share a favorite memory or leave a condolence message for the family.